Alderman Brian Hopkins urged for the council to ignore Emanuel’s request. To appreciate the significance of Mayor Rahm's retreat on Lincoln Yards and the 78 projects, let me take you back in time to a previous TIF debate. The year was 2006. Taylor Hicks had just won the title on American Idol—which gives you an idea of how long we've been slogging at this TIF beast. 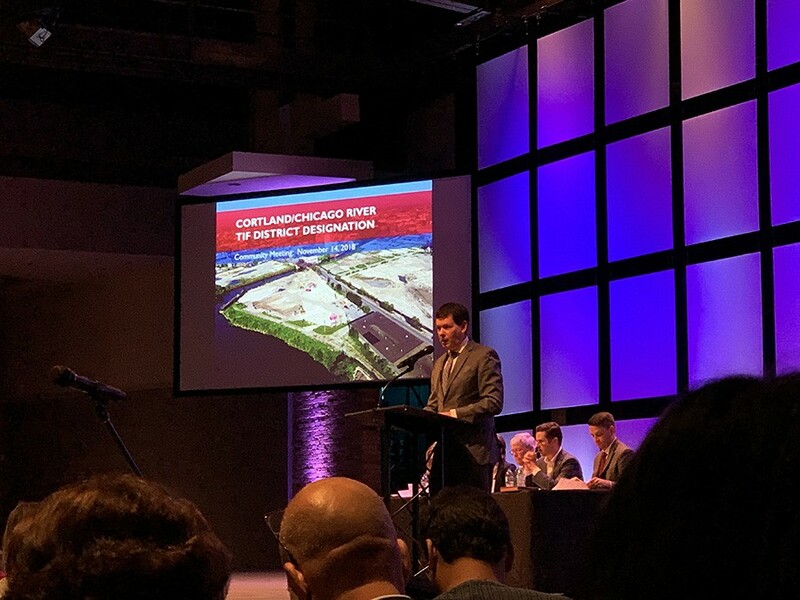 The city's Community Development Commission was entertaining then-Mayor Daley's proposal for the LaSalle Central TIF district—the Lincoln Yards of its time. Corporate Chicago, both editorial boards, and pretty much everyone other than a handful of gadflies supported this baby. Only one public official—Cook County commissioner Mike Quigley—dared to speak against it. And the commission chair tried to keep Quigley from speaking on the grounds that, as a county official, he had no say in the matter. When Hugh Devlin, a Rogers Park activist, testified against the TIF, former alderman Burt Natarus cut him off, bellowing—oh, what does it matter? Back then Burt was always bellowing about something. The CDC unanimously approved LaSalle Central, as did the city council. Since then the LaSalle Central TIF's gathered over $261 million in property tax dollars—far more than all of the TIF districts in Englewood, Woodlawn, Austin, and Roseland combined. So much for fairness in Chicago. Now fast-forward to Monday's council events. Almost every newly elected alderman called for a delay in approving both TIFs. Under pressure from a coalition of activists put together by the Grassroots Collaborative, Mayor-elect Lori Lightfoot asked the city council to postpone approval of Lincoln Yards and the 78 deals until she and her staff finished poring over the fine details. "I want to make sure that we're getting the best possible deal for the city going forward and that we're not hamstrung on other great economic development needs on the south and west side," Lightfoot said on the Fran Spielman Show. Bowing to Lightfoot's wishes, Mayor Rahm asked the council to postpone the vote on the $2.4 billion projects, saying: "I made it very clear to the mayor-elect that I would not move forward on these projects if she wanted to delay the process." Second Ward alderman Brian Hopkins—who's sort of the Natarus of our times, minus Burt's self-deprecating charm—urged for the council to ignore Emanuel's request. "The mayor's not on the finance committee," Hopkins pointed out. True. But of all the things for Hopkins to suddenly find his spine on. Anyway, the deal was postponed. Even as I write that sentence, I can barely believe it. Ordinary community activists forced the mayor to at least temporarily back off on a TIF deal. As the guy who's been pounding the anti-TIF drum since the Reagan years, I feel like Sally Field when she won her Oscar: You like me! You really like me! I'll calm down by pointing out that this fight is far from over. Again, it's only a postponement. For all I know, advocates for both TIF deals may have already bamboozled Lightfoot into complying with their demands by the time you're reading this. Damn, the mere thought has got me howling at the moon. In a perfect world, Mayor-elect Lightfoot and the City Council would blow up the current TIF program. Instead, she'd replace it with ward-by-ward allocation of economic development funds, coming right out of the city's budget—as opposed to coming out of a shadow TIF budget that's largely hidden from public view. That way she could guarantee an equal distribution of development funds, instead of giving the lion's share to a handful of already-gentrifying wards—like Hopkins's. Of course, Chicago's far from perfect—or even fair. Let's start with some baby steps that might make either one of these TIFs almost tolerable. At the very least, city officials have got to start telling the truth about Tax Increment Financing. Currently, this is far from the case. For instance, Alderman Patrick O'Connor, outgoing finance committee chair, recently told the Sun-Times: "I think [Lightfoot] might be happy for the cash infusion coming in over the course of the next 20 years from those potential projects." Planning chief David Reifman seconded this notion, saying, "These sites are absolutely critical as we consider our fiscal issues and our need to grow our tax base without increasing the burden on existing residents and businesses." This is either willful ignorance or just plain old ignorance. Either way, O'Connor and Reifman might as well be telling us the earth is flat. One more time: There will be no "cash infusion" from these TIFs and they won't decrease "the burden" on taxpayers. Quite the opposite: like all TIFs, they're property tax hikes that will increase the tax burden on us all. Neither Lincoln Yards nor 78 will add new property taxes to our coffers from the moment their TIF districts are created until the moment they fade away in at least 23 years—or longer, should some future mayor choose to extend them. Instead, all the new property taxes generated in these TIFs will be used to pay for the projects. In the case of Lincoln Yards, Sterling Bay, the developer, will essentially take property tax dollars that would otherwise go to schools and police and fire, etc. and spend them on themselves. Great deal for Sterling Bay, not so great for the rest of us who will have to come up with new property tax dollars to compensate for the ones we're not getting from Lincoln Yards. There's also the issue of who will pay for the services Lincoln Yards will require—like, cleaning streets, filling potholes, policing the community, teaching the children, and so forth. If there's a fire, someone has to rush to the scene—you don't expect Alderman Hopkins to put it out, do you? Daley's big-box brouhaha obscured the rubber-stamping of the LaSalle Central TIF.